The Ibadan College of Medicine Alumni Association (ICOMMA) homecoming week to celebrate the University of Ibadan College of Medicine (UICOM) at 70 tagged “Àtúnjí: The Renaissanse”, kick-started on November 2nd, 2018 with the jubilation symposium and presentation of the University of Ibadan College of Medicine (UICOM) of 1988. The class has produced lots of iconic individuals such as Prof. Ike Lagunju, Prof. Abraham Ariyo, Prof. Olayinka Olutoye, Prof. Temitayo Ogundiran, amongst others. Prof. Lagunju, who spoke on the topic “Making a success of medical practice as a mother, wife and physician”, endeared the audience to aim high, remain focused and be psychological prepared for all the challenges they may encounter. She also offered helpful tips to ladies at the symposium on how to have a great medical career with their homes intact and further encouraged the audience to seek God in all endeavors. Other topics covered at the program were making a success of medical practice, dental practice and private practice in Nigeria and diaspora. 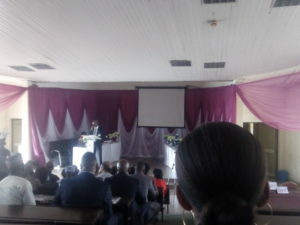 Other highlights of the ceremony was a presentation on the renovation of the hostels at Igbora-Ora with official handover to UICOM, notification on plans to sign a memorandum of understanding with the UICOM on the receipt and usage of the class endowment fund for research, not forgetting the informal interaction of medical students with members of the ’88 class. 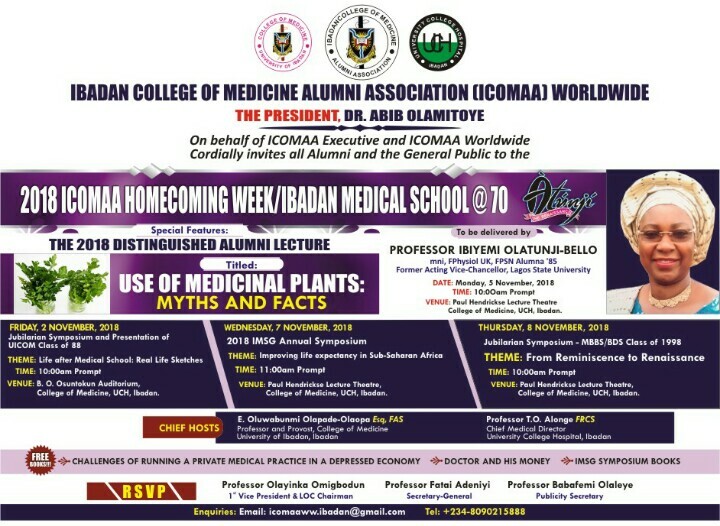 Lots of other programs have been scheduled for the “UICOM at 70” celebration which include a Distinguished Alumni Lecture on the topic “Use of Medical Plants; Myths and Facts”, the Ibadan Medical Specialist Group (IMSG) Annual Symposium, and the jubilarian symposium by the MBBS/BDS class of 1998.